Home » Keeping Ducks » Keeping Ducks FAQ » Can You Keep Chickens And Ducks Together? There are many mixed opinions about keeping chickens and ducks together in the same enclosure. From a purists point of view, they should be kept in separate enclosures but I have kept my chickens and ducks together for many years with very few problems. Here are a few things for you to consider. Chickens and ducks can squabble, just as they will amongst themselves sometimes, but it’s the chickens that can cause the most damage with their sharp beaks. Caution should be taken with Drakes and Cockerels as both can be argumentative at certain times of the year. If they are kept in a large enough area, are able to get away from one another and have access to enough food and water containers, then they can usually live together happily, going about their own business. Ensure there is adequate housing space or provide different housing for each. Remember ducks won’t always put themselves to bed like chickens when it gets dark. As youngsters, chickens and ducks require a different type of food. 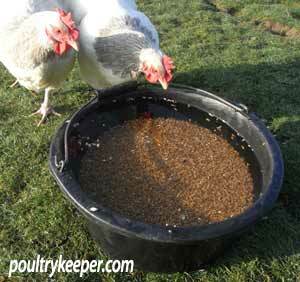 Chick crumbs and Growers pellets intended for chickens often contain Anti Coccosidistats. These are a drug that is added to help prevent Coccidiosis. Ducklings eat at a greater rate than chickens and consequently overdose on the drug and go off their legs and even die. I would certainly not mix young chickens or ducks together anyway but it’s worth remembering their feed should be checked. 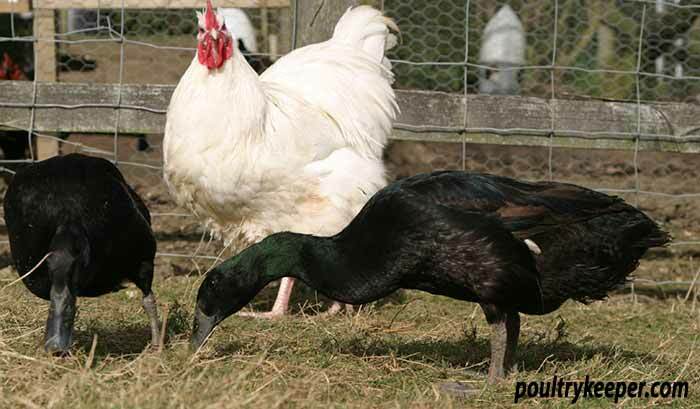 Once both are fully grown, they can both be fed on poultry layers pellets and ducks should have wheat although true free-range ducks will find most of their own food from greens such as grass, duck weed (if available on a pond), insects, bugs and slugs. There is too much calcium in poultry layers pellets for drakes, so make sure wheat is provided for them – this is difficult since too much wheat in your hens diet will cause problems since wheat doesn’t contain sufficient protein levels to maintain egg production in hens. There is detailed information on Feeding Chickens correctly here. What I do, is put wheat under water in a half-size bucket for the ducks. The wheat sinks to the bottom and the chickens cannot eat it. This also stops crows and rooks from taking the wheat, which usually happens if it is left dry in a bowl. As you can see from the photo here, my chickens get rather frustrated! Drakes will regulate their intake between layers pellets and wheat and in the winter when they are off-lay, ducks will also eat more wheat than pellets. 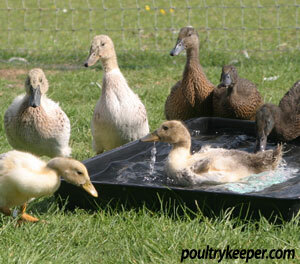 Ducks need water to wash in and they will soon make a mess of chickens’ water containers. If this is the case, water containers can be hung a little off the ground on a wooden tripod with perching bars just off the ground. This allows chickens to fly up onto a perch and take a drink but stops the ducks from reaching the container. A small tub that can be emptied easily is often used for a small number of ducks so that they can climb in and wash themselves or dabble in the water when they want to. If this water is too deep, chickens can fall in whilst having a drink and get waterlogged, and drown. Bricks on the edge of the tub or a ramp out of it can help a chicken to get out if it falls in but it’s safer to have a shallow tub like the one shown here for these ducklings. Garden centres often sell different size trays. The one shown is a small one but my adult ducks get a 4ft square tray that holds about 4 inches of water and can still be tipped up easily. 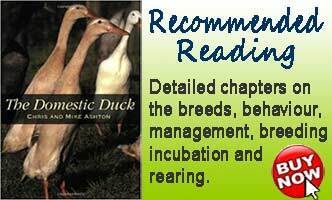 If you keep chickens but are new to ducks then I would highly recommend reading Chris and Mike Ashton’s excellent book “The Domestic Duck” which covers everything you ever need to know about keeping ducks. This is the one book I would call my ‘essential reference’ when it comes to ducks and I find myself dipping into it regularly. You can buy the Domestic Duck on Amazon here.